High Quality, Excellent Price. Fast Shipping! Buy It Now! 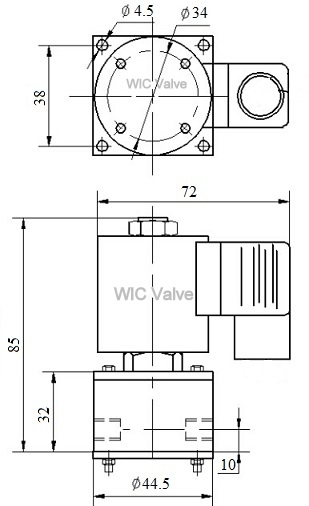 WIC Valve Low Power Consumption Electric Solenoid Valve Continuous Duty Coil. New, Order Now!!! WIC Valve 2PCV Series 2-way normally closed anti corrosion solenoid process valve is to control On/Off of air, inert gas, liquid, acid, alkali and salt water. This anti-corrosion solenoid valve has one 1/4" Inch NPT inlet and one 1/4" inch NPT outlet port. Valve stays close when the coil is de-energized, and it opens when energized. Our unique piston design allows the fluid completely separate with the valve metal components. No corrosive fluid contacts the metal parts. 2PCV Series solenoid valve is a zero differential valve which can be operated at 0 PSI (Vacuum) and it can be mounted in any position. What is advantages of DIN Connector? Instead of using the Grommet lead wires, the coil has the prongs or pins to connect a standard DIN connector. Therefore, the coil will have a male connection and the plug connecting to the coil is a female connector. The DIN connector for this 2PCV series valve is a DIN 43650A 18mm (PG11) type. The advantages of the DIN Connector is that it allows a quick valve or coil exchange. Yet it is a excellent insulation properties and good for water tightness. 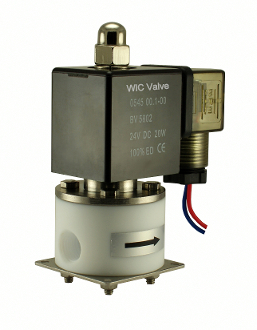 Copyright © 2012-2019 WIC Valve. All rights reserved.